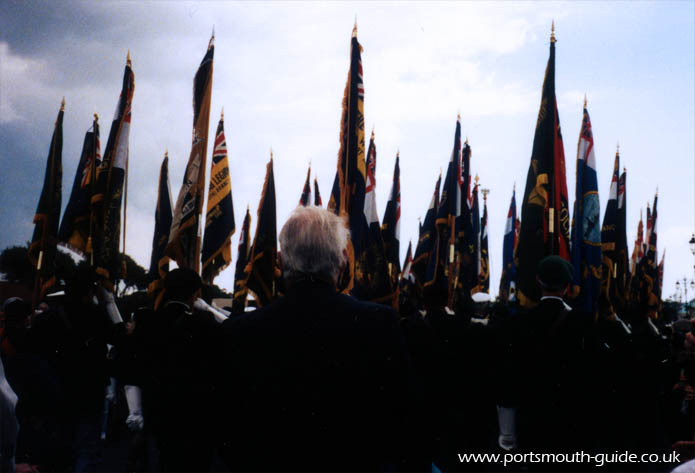 As well as being host to the D - Day 50 commemorations Portsmouth also hosted VE, VJ and Forgotten Fleet Commemorations in the same year. The Duke of Edinburgh attended an open air show to commemorate the Forgotten Fleet. 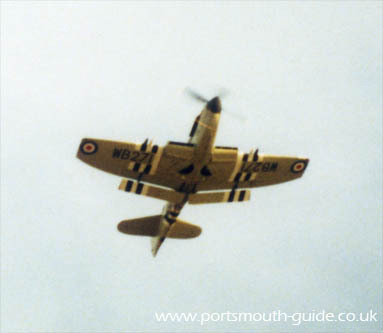 The events featured fly pasts as illustrated by the picture below, Mastmanning, Window Ladder displays, bands and much more. The Veterans had a parade where they marched and the above picture shows some of them holding their flags. Portsmouth after doing well at hosing the D - Day 50 commemorations again did the people proud hosting these commemorations. Many of the veterans wore their medals with pride as this was a rare opportunity for them to meet with some of their old colleagues. The Cities people turned out to the commemorations in their thousands, this hopefully let the veterans know how much the people of Portsmouth thank them for all they did in securing our freedom.